There are really only two wireless chargers out there that iPhone and Android users should consider. If you want a versatile model that can convert from a charging pad to a charging stand, this Samsung fast wireless charger is terrific. 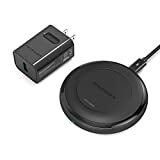 If you want to save some money while also getting a unit made out of better materials (metal instead of plastic), the best fast wireless charging pad Amazon sells is currently on sale at its lowest price ever. The RAVPower Fast Wireless Charger launched at $49.99 before recently dropping to $45.99. Right now, it’s on Amazon for just $35.99 — and that’s before you clip the 10% on-site coupon. That coupon drops the price all the way down to just $32.39, which is an absolute steal. RAVPower Redefines Fast Wireless Charging: our pioneering HyperAir technology delivers the fastest charging speeds for both iOS and Android devices, 7.5W for iPhone X, 8, and 8 Plus, and 10W for Samsung Galaxy S8, S7 and Note 8. 2x faster than traditional 3.5W – 5W wireless chargers. Important Notice: Please do not place any metal or magnetic objects between your phone and charger, or the latter will not work. Equip your device with a Qi receiver if it’s not Qi-enabled out of the box. Does not charge through phone cases thicker than 0.12 in / 3 mm.